It’s that time of year when people start to think about the school year ending and summer beginning. It’s also a time for graduations. When college students graduate many items that made their dorm room feel like home are still usable. Some grads simply throw out these items into the dumpsters. Others bring them home and the items collect dust in your basement or attic for years! To avoid this clutter or waste, consider sharing these items with Grad Bag. 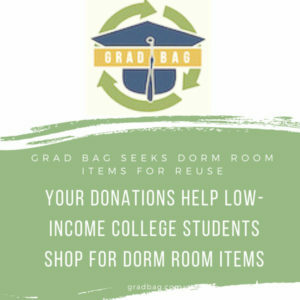 Liz Gruber, Grad Bag’s co-founder, asks for donations to provide low-income students with dorm room items so they don’t have to buy new, and to provide the community with a green way to salvage these resources. Grad Bag is based at Westchester Reform Temple in Scarsdale, and starting May 15, the group will have PODS set up in the back parking lot where items can be dropped off. Those in the Boston area can find Grad Bag at Temple Shalom in Newton, Massachusetts. Upcoming volunteer-led “Community Folds” held at Westchester Reform Temple is on June 28 and July 12. The group cleans, folds and packages hundreds of sheet sets and other linens. It’s a fun setting with snacks and music and a great community spirit. The group then gives everything away in August, before school starts. These events are open to low-income students to come and “shop” for the things they need. They enjoy knowing that they are saving money and helping to keep reusable items out of landfills. And of course, your donations don’t have to happen just this time of year. Consider supporting Grad Bag with financial donations any time of year. Grad Bag has grown significantly over the seven years since its founding, and now collects items from nine colleges in the New York area (Barnard, Columbia, Fordham, Sarah Lawrence, SUNY Purchase, Connecticut College, Princeton, Bard and Wesleyan) and four in the Boston area (Wellesley, Babson, Olin and UMass Lowell). Learn more at www.gradbag.org or by contacting Liz at liz@gradbag.org. I absolutely love this idea! Not just for low income, but mid income as well! They get the hardest in many ways!